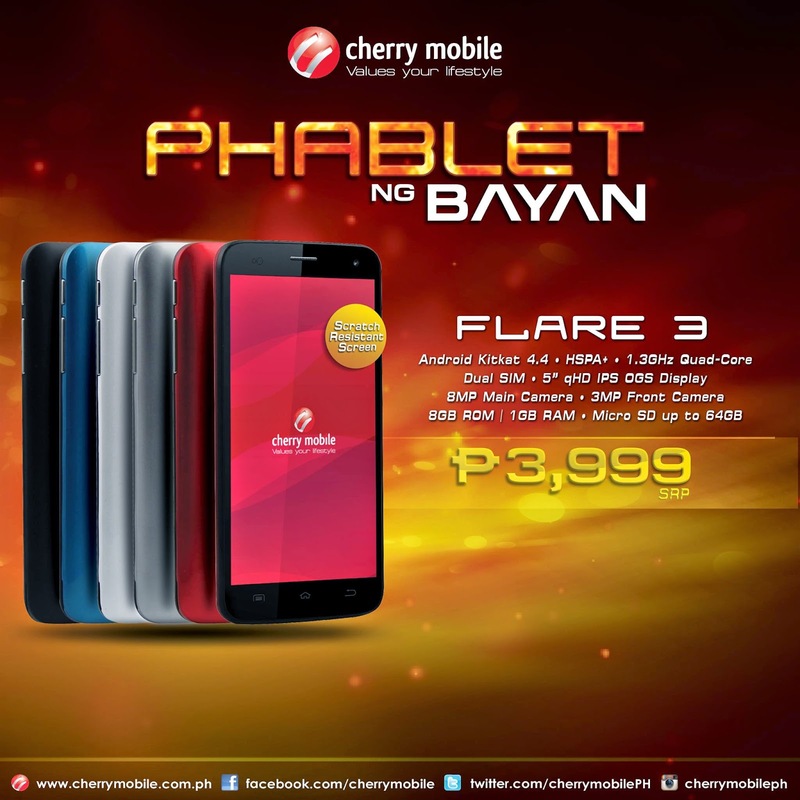 Cherry Mobile Flare 3 is out and is newest addition to the company's most successful smartphone series. 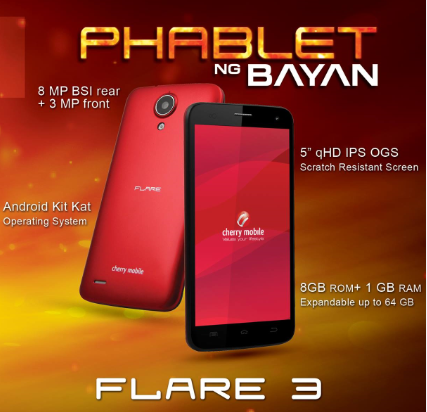 Dubbed as the "Phablet ng Bayan," the Flare moniker has been proven and tested to draw attention from buyers with its affordable price tag on top of the powerful feature set. Now that it crosses the phablet territory, will the Flare 3 match the success of its previous brethren? The previous device that came through Flare line was the Sony camera-powered Flare S2. The device came in the mid-tier department with its 4.5-inch display. Now, the Flare 3 is, by far, the Flare biggest device in terms of screen real estate. It boasts a 5-inch IPS OGS display with 220 ppi pixel density (that's slightly higher that S2's 218 ppi). On the chipset side of things, both devices have the MediaTek 6582M processor ticking on their guts. This variant houses the 1.3-gigahertz quad-core CPU that is allied with the Mali-400 MP2 GPU. There's no overlooking the thought that Cherry Mobile Flare also has 1GB of RAM to spice things up in the multitasking level. However, Flare 3's internal memory is beefier with at 8GB and what keeps this handheld apart from its peers is that it is expandable up to 64-gigabyte through microSD slot. For mobile photogs, your main snapper, the 8-megapixel rear camera is charged with back-side illumination and LED flash. Flipping the device, you'll have the 3-megapixel selfie camera, fit for all your pointing-and-shooting experience. In terms of connectivity, you'll have the 3G HSPA+ version. The dual-SIM or dual-standy capability is always a welcome feature for those jumping in between networks. Likewise, if the previously laid specs won’t suffice, Cherry Mobile is powering the Flare 3 with Android 4.4 KitKat and 1980 mAh battery. Time, and again, Cherry Mobile is always delivering its best when it comes to its Flare products. The company has done great things with our Php 3,999 before. And now with the advent of Flare 3, we have never expected that it could do a lot more - good display, fast processor, latest Android version, etc. I think we could be seeing Flare 3 everywhere in weeks to come.